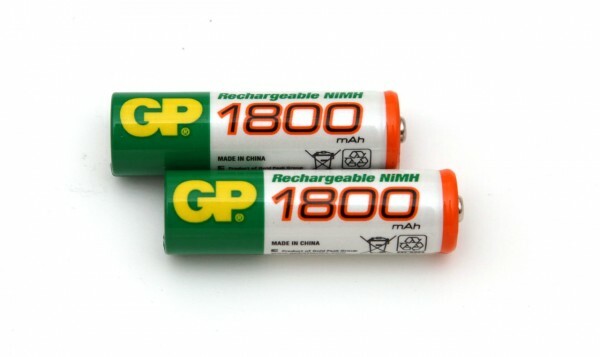 The 1.2V AA 1800 mAh GP Rechargeable NiMH batteries are a middle range rechargeable batteries from GP with a typical capacity of 1800 mAh and a minimum one of 1750 mAh. These are sub 2000 mAh rechargeable batteries they will probably have a hard time at our 2A constant current load test, but they should handle well at lower rates. Since we just tested the slightly lower capacity 1600 mAh model from GP we are quite interested to see how these compare to them, especially since the 1600 mAh model was able to provide a bit over 1800 mAh capacity at 0.2A constant current load. We have started the test of the 1.2V AA 1800 mAh GP Rechargeable NiMH batteries with a constant current discharge rate of 0.2A here we’ve managed to get 1829 mAh or a slightly more than the typical rated capacity. This value is just 9 mAh more than what the 1600 mAh model from GP managed to offer at this test, however moving to higher loads the 1800 mAh NiMHs do manage to outperform the 1600 mAh model. 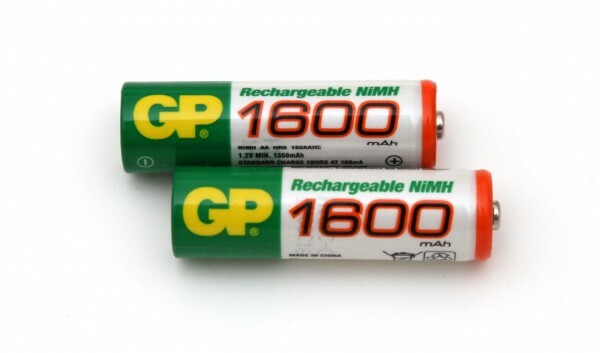 So while for lower loads the 1.2V AA 1600 mAh GP Rechargeable NiMH batteries might perform roughly the same, moving to higher loads this 1800 mAh version will be the better choice as they are able to even provide some useable capacity at 2A constant current load. We have started the test of the 1.2V AA 1600 mAh GP Rechargeable NiMH batteries with a constant current discharge rate of 0.2A here we’ve managed to get 1819 mAh capacity and that kind of surprised us as these batteries are rated as 1600 mAh typical capacity. Furthermore getting a bit over 1800 mAh from a 1600 mAh NiMH battery at a 0.2A constant current load is nothing short of great performance, going to 0.5A constant current load we got 1614 mAh and that is also a bit over the typical capacity that these batteries are rated for, so another great result. At 1.0A constant current load these batteries still managed to provide over half of their rated capacity though we should note that the voltage they provided during most of their discharge cycle was very close to 1V, so this can cause some problems like premature invoking of low battery cutoff. And going for 2.0A constant current load as expected is a it too much for the 1.2V AA 1600 mAh GP Rechargeable NiMH batteries, in fact our power profile test show that they can handle up to about 1.7A load. Nevertheless these NiMH batteries from GP Batteries are performing very good and could be rated more like as 1800 mAh and not as 1600 mAh as our tests have shown. The 1.2V AA 2700 mAh Sanyo Superlattice Alloy EVO NiMH batteries (model HR-3U) we test here are from the traditional NiMH type and not the newer Low Self Discharge (LSD) NiMHs even though Sanyo is also making LSD batteries and is considered as one of the top names for Rechargeable batteries. The NiMH batteries from Sanyo we are testing here are rated as 2700 mAh (that is the typical capacity and 2500 mAh minimum) and that is one of the highest capacity NiMH batteries on the market currently available. What we are expecting from these Sanyo NiMH batteries is to actually provide the said capacity and not behave like some unknown brands making batteries that are marked with very high capacities of over 3000 mAh, but hardly capable of delivering even half of that capacity. What is the most interesting thing here for these Sanyo NiMH batteries, besides their high capacity, is that they are rated as capable of handing very high loads such as 2C (two times their capacity or 5.4A) while till providing very good capacity. We started the tests of the 1.2V AA 2700 mAh Sanyo Superlattice Alloy EVO NiMH batteries with a constant current discharge rate of 0.2A and they were able to provide us with 2527 mAh or a bit over the minimum rated capacity, and at a lower discharge rate they should be able to get closer to 2700 mAh. The important thing here is that Sanyo has a proper rating for these batteries, nothing less than what we have expected from them anyway. Furthermore these batteries are able to handle high current loads very well as you can see even at 2A constant current load they provide close to 1900 mAh capacity. 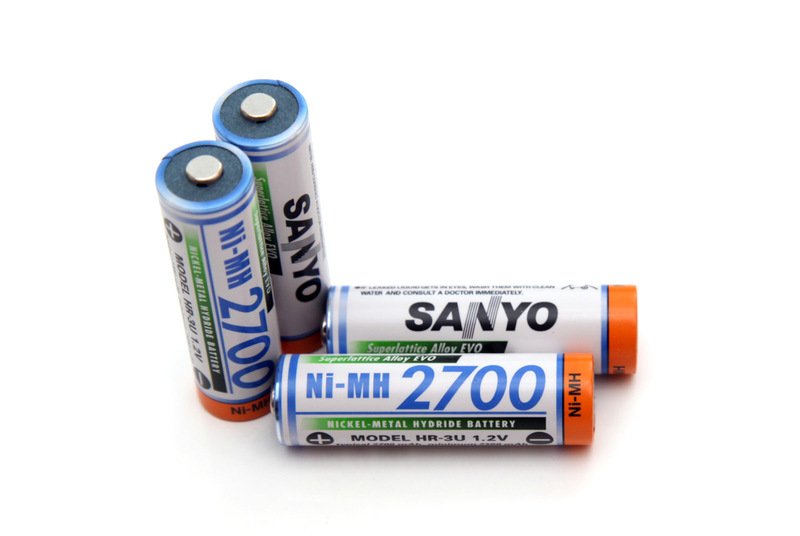 So in overall the 1.2V AA 2700 mAh Sanyo Superlattice Alloy EVO NiMH are very good rechargeable batteries that are suitable equally well for use in applications requiring either low or high current load. They however excel at providing great capacity with very high loads.